Got time for another Edo. G blessing? Swear it won’t take long… and that’s actually our loss sometimes. But this “Beast Off” is good; Edo. going BeastMode over a beat by Torchbaras. Damn if these three don’t form up like the Lion Force, the way they went in on this Teddy Roxpin track! “Voltron” is an appropriate name for the ‘stronger together’ joint from Special Teamz (e.g. Edo G, Jaysaun, and Slaine). Any cultivated underground rap fiend is well-versed in the epic legacy of Special Teamz, supergroup of raw and unapologetic Boston supergroups. So when Edo G, Jaysaun, and Slaine touch the same cut, it is always an occasion to note, with “Voltron” in this case being their first crew joint in years and a banger to boot. Over a dark and ominous creation of producer Teddy Roxpin, the trio returns with triumph and maelstrom on a track fit for a DJ set during happy hour in hell. Edo. G and Shabaam Sahdeeq drop another single (“Yin & Yang”) off the “Recognize Your Power” EP, which is produced entirely by Fokis. Check out the visuals. Kool Keith is “Tired”… of all the laziness… fugaziness… and all the sh!t that is wrong with Hip-Hop. Stuff that rappers could change if they got moving and kept it moving for real. Edo G is on the track (produced by Ol Man 80zz & Futurewave), and on the video, cosigning all of this. Funny thing is that on this track, we could call Edo old school; but Kool Keith is the OG (e.g. the older G) of the two. That old school – true school, Golden Era cool combo is the mode of the “Feature Magnetic” LP (out now). Many of the features are from rappers of the Golden Era who were preceded by Dr. Octagon by a bit. That’s a lotta real raw Hip-Hop on a track there, son! And “Da Hustle Don’t Stop” (featuring Ed OG and Fokis). Sadat X got another one with this one. He don’t stop either… On that “Agua” maaaann!! Edo and King Magnetic trading verses on a tight boom-bappity beat from the one and only 9th Wonder. The video takes us around the zoo for a shoot with these rhyme animals (who were not harmed) behind the bars on the track. It’s Edo from Boston with a new track dedicated to one of Hip-Hop’s most revered producers – Pete Rock. Appropriately titled, this is the official video for his jawn “Living Legend” (featuring Grap Lova x Rob-O). Special Tribute to Hip-Hop Legend Pete Rock off the upcoming self titled album from Gdot & Born ft. Ed OG. Produced by Confidence. Cuts by DJ Technic. Single available now. Album in stores and on iTunes January 28th. They say… Edo G puts it down! They’re right. Here’s proof. @MysterDL (for ILL Mannered Films) and Edo G team up for another dope video. 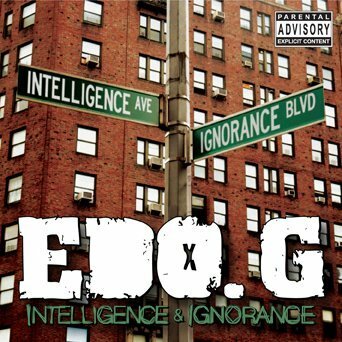 Check it out above and pre-order the Edo G album with this single on it – “Intelligence & Ignorance” – below. Edo. G, the emcee who brought us the Golden Era classic, “I Got To Have It,” is dropping a solo album entitled “Intelligence & Ignorance” (due out February 5, 2013). The album’s lead single – “Done Talking” – is produced by Hip-Hop heavyweight Oh No. Listen below.